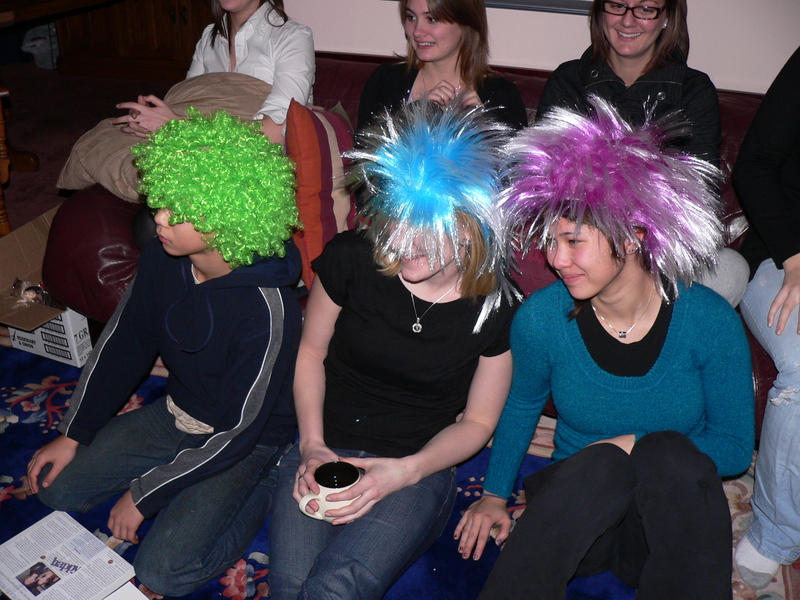 What do funny wigs have to do with Christmas? In this season of giving, I’d like to offer up a suggestion for a last-minute gift exchange that has meaning and doesn’t involve battling crowds at the mall: Exchange donations. I don’t mean just dropping off toys at the firehouse or sending your kids to school with non-perishable food items for the food-bank box. I mean turning at least part of your Christmas gift exchange into a Donation Exchange. I know I’m not just speaking for myself when I say I don’t need any more stuff. Really. But there are people who do need things, so why not channel the money you’d spend on gifts to them? This post won’t be so much about where to donate your money, (though I’ll make some suggestions along the way), but on different ways that families and friends manage a donation exchange. At the simplest level, you could just announce to your friends and family that, in lieu of gifts, you’d prefer them to make a donation, in your name. You could either identify a cause you’d like to support or let them decide on something. This column makes some really good suggestions as to how to go about communicating that preference to your friends and family. Much to my surprise, the exchange was a bonding civic experience for my family…Up to that point, I didn’t even know if my kin supported causes. I found out through the exchange that most of them supported at least a couple causes. Their choices revealed a side of them I hadn’t seen before. Several years ago, once our kids hit their teen years, we started doing a donation exchange with my brother-in-law’s family. Rather than buy each others children gifts, we simply make a donation in the name of the other family. Our rule is that the donation must assist people (rather, than say, Save the Whales), but other than that, no restrictions. We’ve also fallen into a routine of gift-wrapping something inexpensive that symbolizes the gift and we exchange those on Christmas Eve — fun wigs for Angel Hair for Kids; small stuffed animals for Heifer International; Bags with $3 worth of groceries (1-day’s worth for a low-income family) for our local food bank; The Half the Sky book to go with a donation to one of their recommended charities. In another family I know, the grandparents take the money they would have spent on their 17 grandchildren, and donate that to a cause selected by the grandchildren. The “kids” (many of them are in their 20’s now) confer by email before Christmas and then send a card with their Donation Wish to the grandparents. At the grandchildren’s request, they’ve made substantial donations to Kiva, Heifer International, and to local charities. Some families “adopt” a needy family through their church or a community organization. Each adult member of the extended family donates a fixed amount to a fund. A family member contacts the organization, tells them how much they have to donate, and the church matches them up with a family in need. That family submits a Christmas wish list and the donor family shops for the recipients. While this may not get you out of the mall, you’ll sure feel better about buying items that actually make a difference in someone’s Christmas — or life. Families can also sponsor a family on a more ongoing basis through international organizations such as International Rescue Committee. Exchanging donations isn’t for everyone. To some people, the whole joy of the holiday season is the selection of just the right gift for each person they care for. And, frankly, some folks really like receiving gifts. They look forward to seeing what their loved ones have picked out especially for them. That’s fair. But if you have switched to exchanging charitable donations or if your family has a special way in which it does this, I’d like to hear from you. Post your comments below.